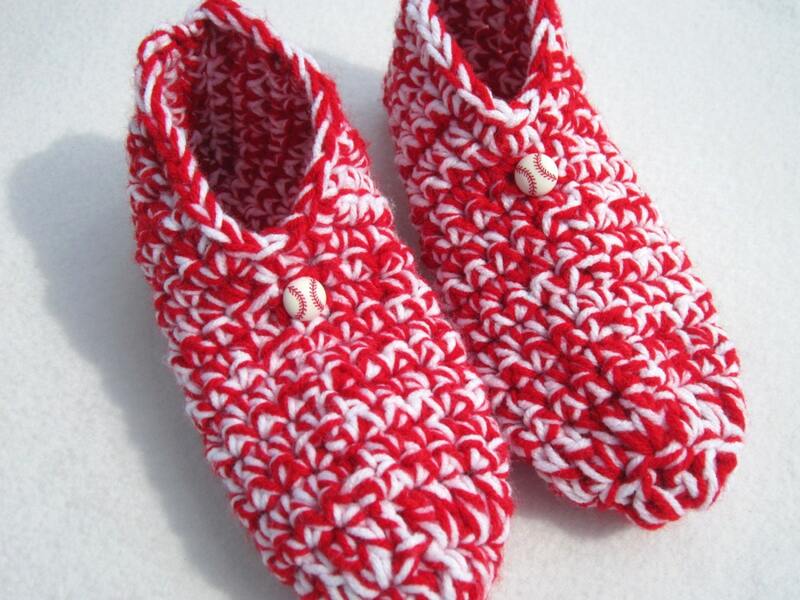 These crocheted slippers have been crocheted using two strands of yarn held together for double thickness and warmth. The yarn I used was red and white. I've added fun baseball buttons to the slippers to give them some style. These slippers would be perfect for your favorite baseball fan! They are St. Louis Cardinals inspired, but would work for the Red Sox or any team with red and white colors. Get them for your favorite baseball mom! They are available in several sizes. Please allow a couple of days for me to make them after purchasing before mailing. I will be as quick as I can. They are machine washable and dryable. They're sure to keep your feet toasty warm while lounging around your house. Even in the summer your feet need to stay warm in the air conditioning while watching those games! If you would prefer this slipper designed in another color or size, please send me a convo for a special order. Very nice, very well made.